Jeff Sessions, Russian ambassador spoke twice during Trump campaign. 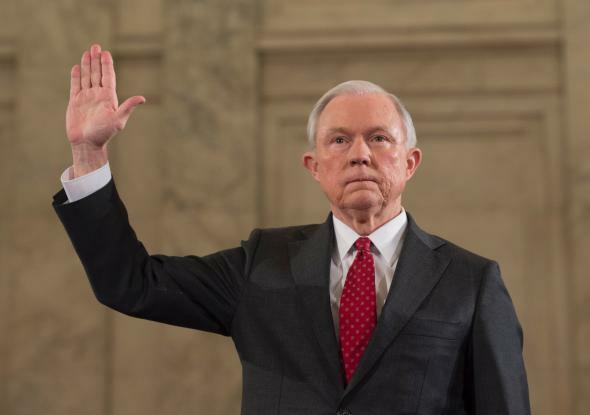 Jeff Sessions sworn in for the Senate Judiciary Committee confirmation hearing on Jan. 10 in Washington. Then-Sen. Jeff Sessions spoke with the Russian ambassador to the U.S. twice last year in apparent contradiction to what the Republican Alabama senator said during his attorney general confirmation hearings, the Washington Post reported Wednesday. Sessions acted as an early surrogate for Donald Trump and met with Russian Ambassador Sergey Kislyak privately in his Senate office in September, according to the Post, while Russia was simultaneously engaged in an expansive effort to influence the U.S. election. The other meeting occurred in July at an event on the sidelines of the Republican National Convention held by the Heritage Foundation, a conservative think tank. Sessions spoke informally with Ambassador Kislyak and several other ambassadors after giving a speech at the event, according to the Justice Department. The revelation that the current attorney general met with the Russian ambassador twice during the presidential campaign is certain to increase pressure on the Trump administration to appoint independent counsel to investigate Trump’s links to Russia during the campaign. Sessions, as the attorney general and head of the Justice Department, also oversees the FBI, which is currently engaged in a far-reaching probe into Russia’s election meddling. The Wall Street Journal reports that, unbeknownst to the now–attorney general, investigators have examined Sessions contacts with Russian officials during the campaign, but the investigation hasn’t been completed.